Download today from iTunes App Store, Google Play, Windows Phone or Amazon App Store! Select to receive push notifications from UBC Houston so you can be in the know with UBC news and announcements! Did you miss last Sunday’s service, or was it so inspiring that you want to hear it again? 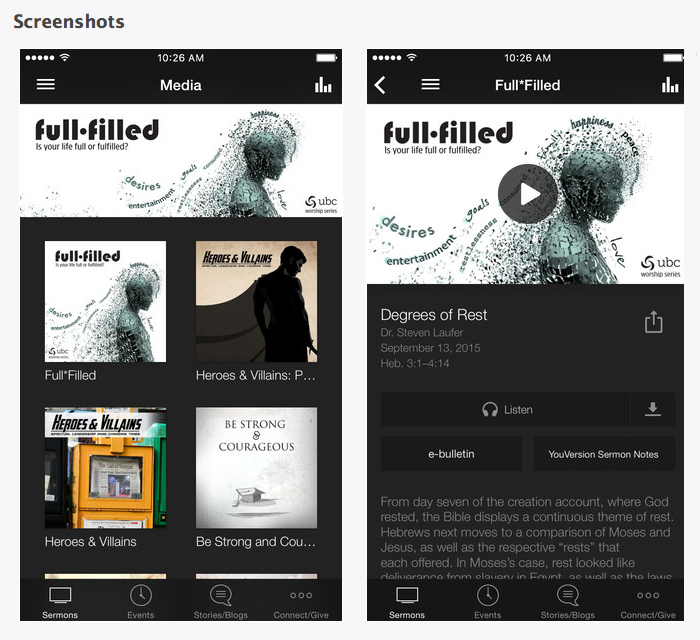 Access past sermons (video or audio), e-bulletin (weekly worship orders) and YouVersion sermon notes, and easily share content anytime! Discover all the great things going on at UBC! Here, you’ll have a calendar view of upcoming events, day/time & location details, and registration and contact information—all in one place. Come here to peruse a collection of event re-caps, ministry reports, and personal testimonies. See how UBC is making a difference here and around the world! You can register for events and easily give when inspired. Share through social media and find other ways you can connect with UBC! Android Users: Now you can facilitate community discussion by gathering together to watch your content, anywhere, anytime! Google Cast allows you to stream UBC media right to your Chromecast, Android TV, speakers, and other devices. Just plug a Chromecast into your TV and stream right from the app! Do you have feedback about the app? Let us know!